Thanks to a long running MTV show, the idea for rock bands to rework their wares acoustically – or, indeed ‘Unplugged’ – reached the point of frenzy in the 1990s. That MTV show saw appearances from the likely (Neil Young, Bob Dylan), to the more interesting (REM, Alanis Morrissette), right through to the completely unexpected (Nirvana, Staind, Pearl Jam). Naturally, some performances worked better than others – it showed how Staind, in particular, just didn’t have the spark or the songs for the format – but, nevertheless, the idea of the acoustic show proved popular with audiences across the globe. Years on from MTV’s peak popularity, the acoustic format still endures: in 2016, we saw acoustic albums from Status Quo, Peter Frampton, Jimmy Somerville and more… Even UB40 got in on the act – with disastrous results. 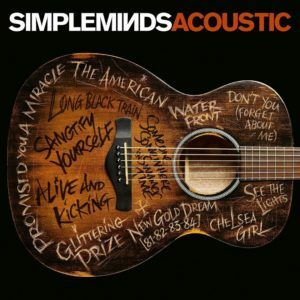 2016 also saw one-time arena fillers Simple Minds going the acoustic route. Following the release of 2014’s ‘Big Music’, the band appeared to be on a high. That album gained them some of the most enthusiastic press since 1989’s ‘Street Fighting Years’, something undoubtedly helped by ‘Broken Glass Park’ being (arguably) their finest single since ‘See The Lights’ all the way back in 1991. Attempting to follow the album with something bigger and better (or even of a similar standard) would be tough, but given that Jim Kerr, Charlie Burchill and company played their first ever acoustic gig in April ’16, it gave them the perfect opportunity to take stock and actually record some stripped back tracks for posterity. And so, ‘Acoustic’ does exactly that. It feels like an important step; time to take stock, if you will. Time also to look at a few major achievements through fresh eyes…and, in some cases, soft rose tints. Of course, none of this would work at all if Kerr didn’t possess a half-decent voice some forty years into a career…and luckily, he’s in good form throughout. While the track listing is somewhat predictable, the band choose to begin the semi-acoustic set with one of their more interesting choices. ‘The American’ – a track pre-dating their huge fame – gives Burchill ample opportunity to finger-pick at a crisp set of strings, working the number’s almost circular riff in a very upfront style, while the quieter approach to the main tune allows plenty of space for an almost mechanised heavy beat to carry everything. The generally busy style makes it obvious why it’s given pride of place at the head of this set. In the centre of everything, Kerr mumbles through the verses and rises to the still-repetitive chorus building atmosphere as he goes and, all things considered, it works well. ‘See The Lights’, meanwhile, is a hundred times better, presenting a percussive bent and a confidence in the performance that puts ‘The American’ to shame. The very rhythmic style does nothing to change the main melody and as Kerr calls against an intermittent shimmering guitar sound, it comes as a reminder – if needed – that this is an amazing pop song. The main structure of the track is intact and a loving homage to its soft electric forefather, but by the mid point, there’s a nice tweak. The introduction of a slightly bluesy slide guitar adds an extra dimension without becoming too dominant, showing how this was kind of meant for the soft acoustic format. The return to the chorus, obviously, really hits home with a still great refrain. With a strident rhythm, the U2-ish ‘New Gold Dream’ works well in its new suit, as a hard acoustic makes everything rattle like a musical freight train, with the solid guitar sounds augmented by occasional piercing leads and stomping drum, before ‘Someone Somewhere In Summertime’ summons up more of an atmosphere with Kerr crawling through his lyric in an understated fashion, allowing the clean lead guitars to call out against a solid – if a little quiet – backdrop. Another pleasant listen, the recording that has hints of a Daniel Lanois production and these two numbers go a long way towards showing how this project really has merit. Much less enjoyable, ‘Waterfront’ comes with an odd country-esque shuffle, but the presence of another chiming guitar suggests it might work. By the time Kerr starts to sing, however, it’s obvious that this was always one of those tracks that almost solely relied on its own bombast…and by the end of the second verse it’s actually a bit of a let down, despite inflated drums and a female vocal bolstering everything (somewhat unsuccessfully). It’s not a skipper by any means, nor is it the worst attempt at the stripped back unplugged format, but it’s certainly one of the weakest tracks on ‘Acoustic’… The once new wave ‘Chelsea Girl’ also loses the album momentum in a big way. With the verse’s guitars reduced to dull muted notes, this is too minimalist by half and without much going on, it makes it too obvious that this earliest representative of the SM hits was never really the best to begin with. A pleasing lead break lifts the spirits, but between the very dull verse and the repetitive hook – a bit grating without a bombastic accompaniment, to be honest – it’s little more than okay. ‘Sanctify Yourself’ saves face by not trying anything different, merely running through the ’85 hit as an enthusiastic slab of jangle for the most part, before the increased presence of drums, a harmonica and an all-important female counter vocal push all the right buttons…the same of which applies to a safe rendition of ‘Alive & Kicking, presenting almost six minutes worth of Kerr in good form before sparring with the backing vocalist, while Burchill and bassist Ged Grimes drive everything apace. These tracks had potential to be drastically reconfigured and it would have been interesting to hear the band approach them in a very different way, but since both are still among the album’s highlights perhaps it was the right decision not to meddle. In many ways, ‘Don’t You (Forget About Me)’ is approached with a similar style, but is weaker by comparison. Part of this is due to the globally dominant qualities of the original recording (despite not being written by the band, it remains their best known song worldwide), but it’s also due to parts of it lacking the hefty strummed edge that this album’s best tracks use as their root. Given time to attune yourself, it’s enjoyable enough by the time the closing “la-las” roll around, but if heard in the wrong mood, they can feel like a long time coming. It would probably be fair to say that this take on the much loved hit is fine…but not really much more. ‘Sanctify Yourself’ was great, but if there’s reason enough to buy ‘Acoustic’, it’s the version of ‘Promised You A Miracle’. The once gloriously 80s, almost new romantic hit is now a heavy stomper, driven by two guitars and an almost busker friendly quality. The rigid, stomping aspect has a massive amount to do with the presence of the brilliant KT Tunstall on second guitar, very much giving everything a feel of her own ‘Black Horse & The Cherry Tree’. She’s also on second vocal, occasionally making Kerr seem like second fiddle on his own elpee…but it’s a track re-worked with enthusiasm by all. Equally superb, ‘Glittering Prize’ has a live in the studio feel in places, something which gives it great strength. It might have lost that distinctive bass line and it’s slightly garish 80s confidence, but the heart of the song is still very strong and the hard-strummed acoustics represent the best of the stripped down format. In short, there’s a friendliness and warmth to this performance, clearing showing a love for something that’s been a part of SM history for almost three and a half decades at the time of this recording. Closing this acoustic set is a cover of Richard Hawley’s ‘Long Black Train’, which is an interesting choice to say the least. While the downbeat, almost waltzing tune allows Burchill space to drop in a few pleasing harmonics and Mel Gaynor’s drumming lends a soft and occasionally jazzy accompaniment, it doesn’t always feel entirely right. It’s well arranged and beautifully played, but it’s just a bit too slow and moody for Kerr. As part of the overall picture, it shows a side to Simple Minds that’s rarely heard, so that’s important, but it mightn’t have been the best decision to end this collection in such a mopey fashion. Simple Minds were always likely to find themselves on a sticky wicket with ‘Acoustic’. Not only was ‘Big Music’ a tough act to follow, but also there were going to be people who felt the re-recordings route was a little lazy. On top of that, pedants are bound to harp on about the still electric elements of the album…and the purely cynical would see the record as an easy Christmas stocking filler, especially given its timely November release. Still, it is what it is: like it or not, the easy, paired down approach is a timely reminder of what great songwriters Kerr and co could – and at the time of ‘Big Music’ continued – to be. The only real complaint is the safe choice of tracks chosen. It would have been interesting for them to delve far deeper into their vast catalogue of album tracks rather than relying heavily on hits, but given how awfully this could have turned out (UB40 should take note), it’s a minor quibble. For both the band’s fans and the merely curious, ‘Acoustic’ is an easy listen but, thankfully, it’s also a largely enjoyable one. This entry was posted in Album & EP Reviews and tagged acoustic, jim kerr, kt tunstall, simple minds, unplugged by Real Gone. Bookmark the permalink.